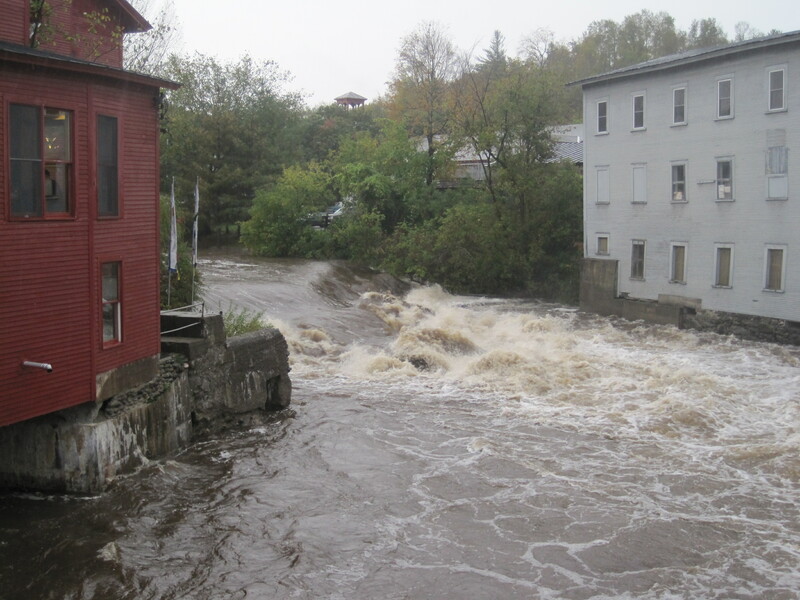 High water rushes past buildings in Johnson Vermont, in this photo I took Friday morning. Every time I say, “Gee, it’s getting kind of dry out there,” disaster strikes. As if on cue after such a comment last week, Vermont has had up to 5.5 inches of rain since yesterday, and the rain keeps pouring down. Roads are closed, more roads will close this afternoon, crops will drown and there might be some evacuation, says Vermont Emergency Management. It’s not a super big disaster, as disasters go. But it once again proves that if you wait a minute, the weather in Vermont will change on a dime. Time to build an ark. This entry was posted on October 1, 2010 at 4:29 pm and is filed under Uncategorized. You can follow any responses to this entry through the RSS 2.0 feed. You can leave a response, or trackback from your own site. the river behind our house crested at the highest level ever—from pne of its lowest levels ever, in just a few hours–a really FAST and scary rise!